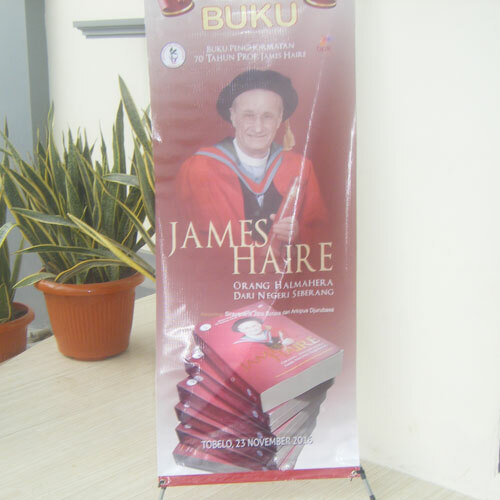 On 23 November 2016 the Reverend Professor Emeritus James Haire AC, former Executive Director of the Australian Centre for Christianity and Culture (ACC&C) and former Director of the Research Centre for Public and Contextual Theology (PACT), was presented with his second Festschrift (volume of essays in his honour) at a ceremony in Indonesia to mark his 70th birthday. The volume of over 630 pages contains 30 chapters by a group of international scholars, both Christian and Muslim, on aspects of Indonesian cultures, Christian - Muslim relations, ethical issues particularly in relation to crime and punishment, feminist theology, and contextual theology, particularly public contextual theology. The volume, mainly in Indonesian, was published by one of the major academic publishers in Jakarta. Around 1,000 people attended the launch. The Government of Indonesia purchased 100 copies for distribution for use in national development in the hopes that it will assist in the management and reduction of Muslim and Christian tensions in Indonesia.